What They Say....There are many reasons to bake: to feed; to create; to impress; to nourish; to define ourselves; and, sometimes, it has to be said, to perfect. But often we bake to fill a hunger that would be better filled by a simple gesture from a dear one. We bake to love and be loved. What I Say....Sometimes when you are reading a debut author, it can feel disjointed, as they try to find their voice. This wasn't one of those times. Sarah Vaughn has an assured, steady voice, and created a variety of characters that you cared about. She wrote the older, overweight contestant as well as she wrote the cash strapped, young single mom. Her presentation of Mrs. Eaden's story was just as interesting as the characters of today. She also wrote the food....very well. 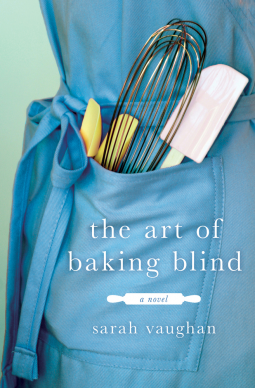 I was seriously craving baked goods the entire time I was reading this book - NOT GOOD! The descriptions of the baking and it's results made you want to run to the nearest bakery to try everything in the book. My only real complaint, and it's not a complaint, but rather a suggestion from the readers point of view, is that there were maybe one too many main characters. I think trying to tell five (six if you count Mike, which I don't, he really should have just been a side character in Claire's story) very interesting stories, left it feeling a bit incomplete. I think had there only been three (I would have eliminated either Vicki or Karen), we could have gotten even deeper into their storylines and felt more passionately about each of them. When you read the description of the book, it may not appeal to some, who will think it is just bland chick lit, but there was a definite grittiness to the character's backstories that made it a lot more interesting. I think the author should pursue those storylines a little deeper, and paring down on the main characters would give her the chance to follow them further into their world. As a reader, I was left wanting to know more about all of them. Maybe a follow up on Karen is in order? I think her story truly could have been a stand alone novel. Definitely a new author worth watching out for. Thank you to NetGalley and St. Martins Press for this ARC in return for an honest review.